Overflowing aid isn't yet ceasing for a 12-year-old boy who sells pan de sal and was forcibly robbed as seen on a video footage. Local government of Caloocan City seriously offered a P50,000 reward to captivate the criminal. The video of a child shuddered in fear was recently uploaded in YouTube and became viral. As we recall, Caloocan City Police released CCTV footage of such suspect who is under 18 to 20 years old while leaving the crime scene. 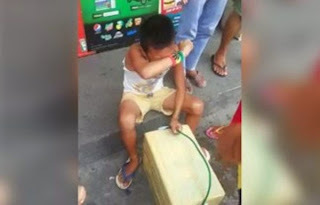 The child positively identifies the suspect who threated him by using knife as a weapon then swept all of his P200 income from selling pandesal that day. Thank you for reading P50, 000 Reward for Capturing Robber Who Laid Hands on Poor Pandesal Boy posted on the website Kwentology if you want to redistribute this article please include the link as the source. Have some kuwento to share? Contact us!